Boning Knives for restaurant kitchens come in durable stainless steel for a rust proof life. These restaurant boning Knives are strong for busy commercial kitchens and are used for boning meat, fish, and poultry. They usually have a narrow blade and have slender and sharp points. Buy your wholesale boning Knives at the restaurant supply superstore. We stock Boning Knives from top manufacturers like Mundial, Forschner and Russell Harrington. 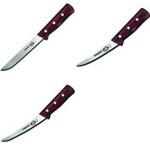 Forschner Straight Edge Boning Knife - 6 in. Mundial Narrow-Stiff Boning Knife Handle White - 6 in. Mundial Semi-Stiff Curved Boning Knife Handle White - 6 in. Russell Narrow Boning Knife - 6 in. Russell Flexible Boning Knife Black Handle - 6 in. Russell Wide Boning Knife Black Handle - 6 in. Russell Narrow Boning Knife 6 in. Russell Wide Boning Knife - 6 in. Russell Narrow Curved Bonning Knife - 6 in. Russell Stiff Curved Boning Knife - 6 in. Buy your kitchen Knives from the leader in restaurant supply boning knives. We stock top quality ones from top manufacturers like Mundial, Forschner and Russell Harrington.